After being diagnosed as a freshman with hypothyroidism – a disorder in which the thyroid gland fails to produce sufficient thyroid hormone, causing fatigue, lack of focus and other symptoms – Samantha Madala, now grade 11, became determined to help prevent health problems from interfering with children’s education. To that end, Madala founded Healthy Scholars last year to raise awareness of health issues that could stymie education. In December, Madala and her team trekked to Varni, India, to perform screenings for medical problems that could be obstacles to learning. Healthy Scholars worked with organizations in India, including the Lions Club, NICE Hospital and LEAD Foundation, to offer blood pressure tests, individual medical consultations, dental exams, vision and hearing tests and more to nearly 600 schoolchildren. “Students who exhibited symptoms such as intense fatigue, inability to concentrate, memory loss, weight gain, cold intolerance, irregular menstrual cycles and dry skin were referred to bloodwork,” Madala said. “During the screening process, I also interviewed and helped identify girls who were suffering from hypothyroidism, like me, and had yet to be diagnosed.” Healthy Scholars paid for the necessary blood tests with funds provided by donors and other charitable organizations. Those with impacted hearing were treated to ear cleanings with an ear wax removal device provided by Clear Ear, whose president Lily Truong is also on the Healthy Scholars team. 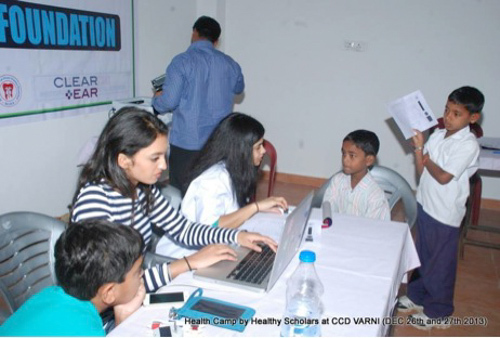 The Meghna Institute of Dental Sciences offered free dental cleanings to students with dental problems. “Ultimately, students received thorough physical examinations, with emphasis on symptoms that can impact learning, and were connected to affordable or free treatment options. For many of these students, our screening was the first physical health exam they had ever received,” Madala recalled. Healthy Scholars also is looking into the possibility of partnering with Stanford University’s Medical Scholars Research Program, which would provide the opportunity to conduct medical research at screenings. An iPhone app designed to help maintain ear, nose and throat health – with a focus on ear and thyroid problems – is also in the works. More information about Healthy Scholars and its current activities can be found at its website. Healthy Scholars is a 501 (c) 3 nonprofit organization, so all donations to the organization are tax-deductible.